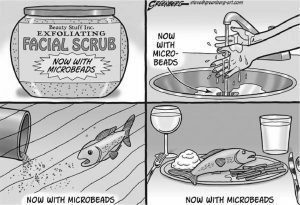 What are micro beads and what is the problem with them? Microbeads are really tiny plastic particles usually smaller than two millimeters. The composition of microbeads can vary and often include polyethylene (PE) or nylon. Bottom line, it’s all plastic! Most people have no idea that those little beads are actually bits of plastic! If you see any of the following ingredients: polyethylene, polypropylene, polyethylene terephthalate or polymethyl methacrylate you’re cleaning up with plastic and being duped into contributing to plastic pollution in the environment—yikes! This question is kind of hard to answer because (surprise!) industry isn’t being real forthcoming about why they want to substitute one kind of plastic for another. Companies want to keep the plastic in their products because it’s cheap and easy to source. But more importantly, plastic microbeads are smoother than natural alternatives like apricot shells, jojoba beans, and pumice. Why is smoother “better”? Smoother means these cleansers will be less effective at exfoliating, which means you can use them everyday, which means they want you to buy more of their Stuff!